Don’t let the seasons and elements ruin your favorite toys. Rain, wind and sun can cause serious damage to motorcycles, ATV’s, tractors and other smaller vehicles if left unprotected in foul weather and prolonged sunshine. You can easily protect both cruising and racing bikes as well as ATV’s, snowmobiles, jet skis and other recreational equipment that may not fit in a cluttered garage. These frames are constructed using heavy-duty structural steel and the covers are waterproof, triple laminated polyethylene material that is built to last. Select models have double zipper front and rear doors with an anchoring system. 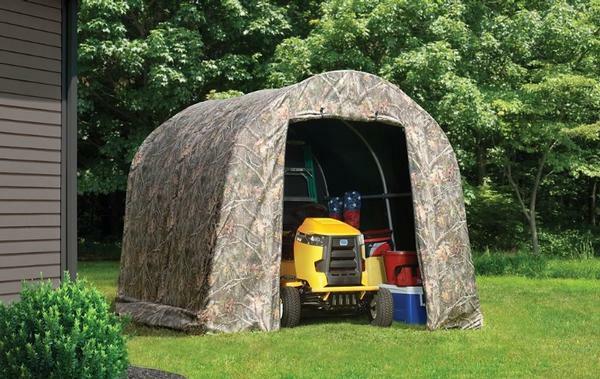 Portable garage shelters are lightweight and easy to transport so you can carry one with on a motorcycle trip or snowmobile adventure. 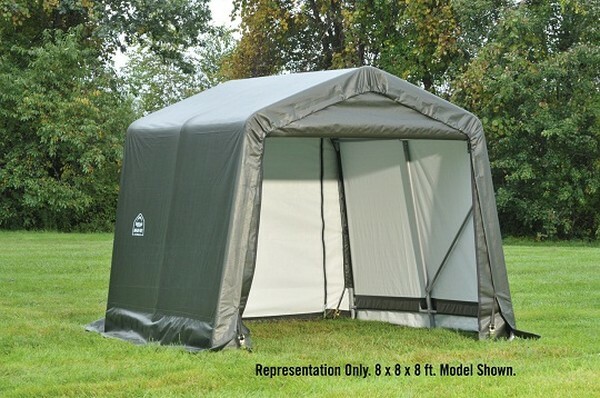 Easy to assemble and take apart you can have a sturdy, durable shelter in minutes to protect against sudden storms or overnight stays. All fabric components feature heat welded seam construction and have bright white interiors for solid visibility in daylight. We carry a terrific range of sizes and colors including gray, green, tan and white. 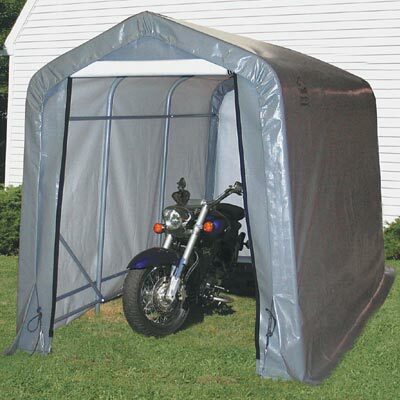 Choose your motorcycle storage cover or ATV shelter direct from our online store. 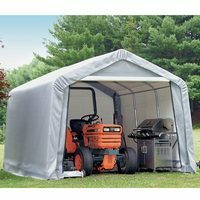 Portable Garage Depot has affordable custom motorcycle storage garage covers or portable storage sheds for any of your motorcycle needs. We offer heavy duty construction with your choice of powder coated or double galvanized steel tubing to give you the ultimate in protection against the elements and corrosion. 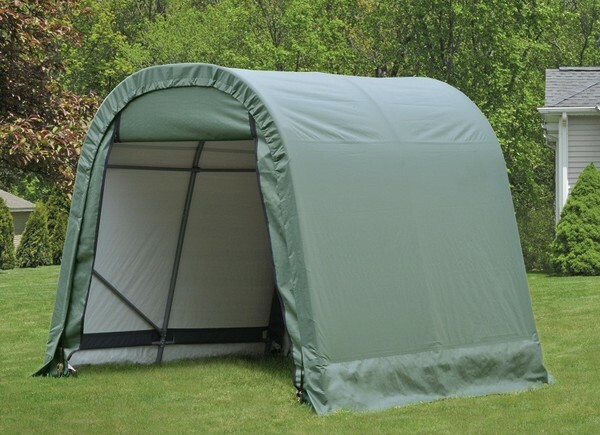 Our polyethylene covers are UV resistant, fire retardant, and consist of a rip stop material to avoid tearing, with wind brace supports to avoid falling in tough weather. Whether a custom motorcycle, maybe a work in progress, our portable shelters are right for you. Our all weather temporary motorcycle storage shelters come in a variety of sizes, styles and colors, to make your choice a confident one. Store whatever you like in one of our portable storage sheds while your motorcycle is on the road. Seasonal equipment, patio equipment, garden accessories, workshop area, materials and anything else is safe in one of our all weather, heavy duty temporary storage sheds. 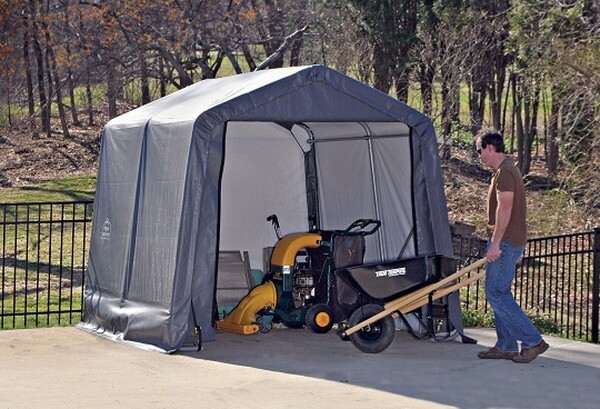 Protect your personal use vehicles, motorcycles, or all terrain vehicles from harsh elements in a Portable Garage Depot temporary motorcycle storage shed. Whether you own one or five, we can accommodate any spec requirements you may have. Styles include Quonset round, peak or house and for the collector, we offer a truss style big building that offers the ultimate in space and protection. Like the rest of our all weather portable products, all of our portable motorcycle covers and shelters come with easy to read instructions, which allow for easy to assemble construction. Simple construction is because of an easy bolt design that allows you to assemble your shelter with minimum tools in minimal time, without compromising the strength of your new temporary motorcycle cover or shed. Being a leading manufacturer's supplier of affordable portable storage solutions, we offer the lowest in factory direct pricing. Let us be your number one source for quality, heavy duty, temporary storage sheds and buildings. 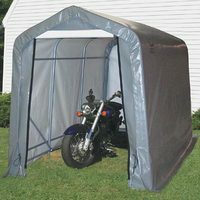 Cover it with a custom motorcycle cover or shelter from Portable Garage Depot.